Our longtime District Conservationist Chuck Reynolds retired at the end of 2018, after 34 years in Holmes County and a total of 38 years with USDA Natural Resources Conservation Service. As we have been digging through the archives for photos we can use to embarrass him during the “Farewell Chuck” tour, I’m struck by how much has changed in the last 30+ years. And at the same time, ironically, how much has stayed the same. Big hair, big glasses, big shoulder pads (not on Chuck, thank goodness), elicit laughs and memories of the “good old days.” Certainly, people change over 30 years, unless they can afford a really good plastic surgeon. And agriculture has changed considerably across the state, too. We have fewer small farms, bigger tractors and equipment, and a lot less dairy farms. Hundreds of thousands of acres of farmland have been lost to development. Meanwhile, the number of acres needed for grain farming generally has gotten bigger, due to the economy of scale required to be profitable. We all get that change is inevitable, but the rate of change the past few years is dizzying. 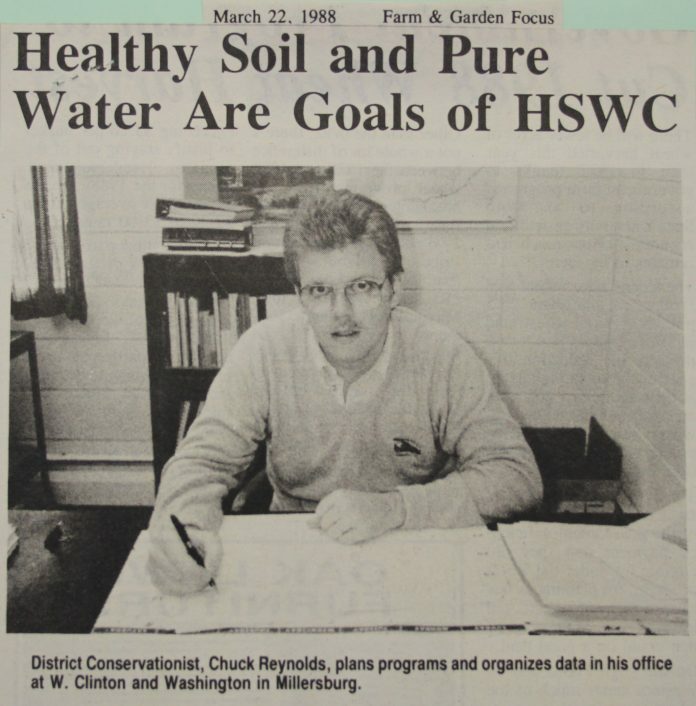 But here’s something that hasn’t changed — a headline from the March 22, 1988, of the Holmes County Bargain Hunter featuring Chuck Reynolds states, “Healthy Soil and Pure Water Are Goals of HSWCD.” Guess what, those are still our goals here at the Holmes Soil and Water Conservation District, and of every soil and water conservation district in Ohio. The programs that we’ve had over the years to meet them have changed somewhat, but the goals are still the same. Healthy soil is arguably one of the Earth’s most critical natural resources, necessary to grow the food needed to feed Earth’s population. It is a substance that few people understand and most take for granted. A single rainstorm can wash away centuries-old soil from poorly managed or bare ground. Since 1 inch of topsoil takes approximately 500 years to form, this is a problem. SWCDs encourage management of cover crops, no-till, and crop rotations to keep a growing crop on the fields as much as possible, or at least a fair amount of residue to minimize soil erosion. Clean water seems like a no-brainer, yet many are unaware of the impact that we all have on water quality. A little bit of nonpoint pollution — from sediment runoff carrying nutrients, manure improperly applied, chemicals or medication down the drain, building a house or structure with no runoff controls — all add up to degraded water quality. We can’t point the finger at someone else without looking in a mirror and asking ourselves what we are doing to improve water quality. Many SWCDs in Ohio have celebrated or will soon be celebrating 75 years. The beauty of conservation districts is that our programs are locally led, flexible, and based on the needs of each of our counties. Our districts are here to offer advice, planning and engineering assistance to keep soil healthy and increase water quality. Whether you are a farmer managing thousands of acres, or a homeowner, you can make a difference through conservation practices. Conservation never goes out of style! Contact your local SWCD for more information. 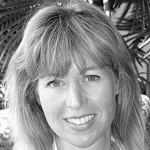 Michelle Wood is the program administrator for the Holmes Soil and Water Conservation District. She is a graduate of Mount Union College with a degree in communications, and has been involved in natural resources and agriculture throughout her career.